Click here to download your free study guide to Isaiah from John Bytheway. Click here to learn more about Isaiah for Beginners an audio talk by John Bytheway. 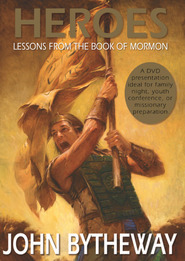 John Bytheway offers a clear, no-nonsense approach to Isaiah in the Book of Mormon. I have his book, which is an easy read that my niece pointed me to when she was in high school. She promised that it had really helped her, so I bought one for my Kindle. Now with the audiobook like others who may commute, I have no reason not to dive into Isaiah before our Old Testament Gospel Doctrine Classes land on these chapters this Fall. Sadly I am a slower reader, but not when the author is reading to me. The excitement in Brother Bytheway's voice makes me want to read along, and that is what I did. However, he is not afraid to add more in this audiobook than his written version. I like that value-added service. I don't know how you got him to read his own book, but it is amazing — I am so glad for this companion to my study, but even more to experience Brother Bytheway's enthusiasm for Isaiah. Wow. Finally a simple, entry level introduction to Isaiah! John Bytheway makes it entertaining yet profound - I'd recommend this to anyone, old or young. The audio book is my favorite because you can hear John's incredible voice inflections and expressions. Perfect for the upcoming gospel doctrine lessons! This is a fantastic book. I have probably read the Isaiah texts of the Book of Mormon 20-30 times and always struggled with it, even on my mission. Last year when I was studying the Book of Mormon daily with the Institute manual I once again came across President Packer's council to read the footnotes in the corresponding chapters of Isaiah to help unlock the meanings in 2 Nephi. I had read this counsel many times but only just had the aha moment nearly 30 years after he first gave this counsel. I laboured for 2 weeks and started to have a basic understanding of the Isaiah texts. Brother Bytheway's book helped me greatly unlock the meanings and extra contexts further. His book has helped me understand better how and why Book of Mormon prophets wrote this great scripture. I would recommend this book to anyone wanting to understand the important message of Isaiah better as well as it's relevance to us in the latter days. 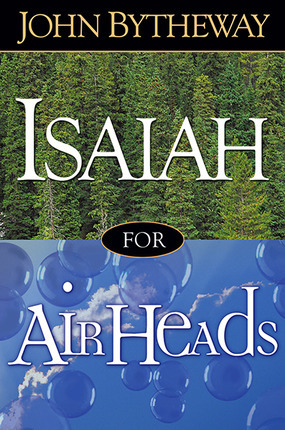 I am still an Air Head when it comes to Isaiah but now my brain is a little more denser with understanding and a little less air. I have both the hard cover book and ebook versions and I much preferred the ebook as I could go to the relevant scriptures a lot quicker and easier. But that's just my preference as both are great resources. Great help with 2 Nephi! This is a great read-along book for anyone who struggles with understanding Isaiah. 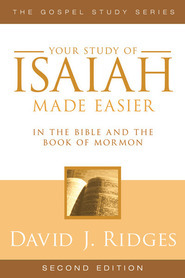 It contains insights about all of the Book of Mormon Isaiah chapters and for me, it really opened Isaiah and made it exciting to read. Although we've been commanded to study and learn these particular passages, I've always felt as though I were standing on the other side of a locked door when it comes to them. This book presents the keys and gives a break-down that literally guides you through the chapters and helps the reader become independently engaged in unlocking these amazing treasures. I've read it completely through while following along with the scriptures and have begun again breaking them down a few verses at a time and then journaling about them so I can write my own commentary to help me better retain what I'm learning. In doing so, I've discovered why we are commanded to know them and understand them. Isaiah knew so much about our day and the calamities and challenges we would face as a people and particularly a nation. He also discusses what are now current worldwide events but in his day, future prophecy. These chapters are amazing and well worth the time to reveal! This book really helps you to understand Isaiah! It is amazing! It is extremely difficult to write an easy to understand yet useful book on a difficult subject. Too little and too simplistic and it doesn't help; too much and too detailed and it overwhelms the lay reader. I think John Bytheway has achieved a useful balance for those who would like to be more comfortable with Isaiah, without becoming obsessive about it. This book is AWESOME! I get so excited every time I sit down to read it because I am actually understanding Isaiah for the first time in my life. John Bytheway makes it seem so simple and so applicable to my life. I knew it would be good because Bytheway is always good, but I didn't know how exciting it would be to really disover these scriptures as if I've never read them before. I don't have enough room in my margins to write all of the notes that I want. Thank you, Brother Bytheway! !